A Pebble on the author’s slabby big man wrist. 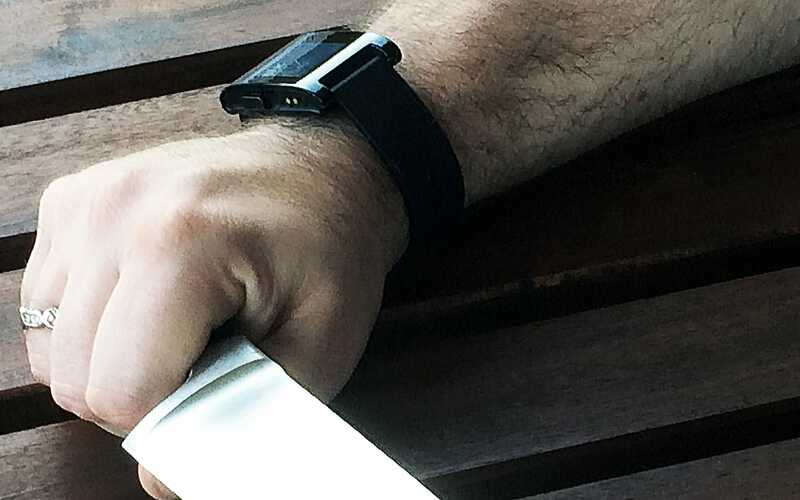 Why whatever Apple is about to release will not be anything like the Pebble or Android Wear. The rumor mill has been working itself into a fever pitch about the new product category Tim Cook has stated Apple will enter this year. Most of the speculation has focused on the so-called iWatch. But speculation is all it is. The only thing I’m sure about when it comes to this new product category is that it won’t be a watch. Why? Because a smart watch is a niche device and Apple isn’t interested in anything that won’t ship millions of units per quarter. A smart watch will not do that. At least not a smart watch as we know them today. I say this as a happy Pebble owner. I love my Pebble. For me it’s great: Getting notifications on my wrist is fantastic and having a stopwatch and timer as well as the ability to control music and podcast playback from my wrist is very nice. But then, I’m a huge nerd, the kind of person who thinks it’s worth it to charge yet another device twice a week in order to get notifications on your wrist. The smart watch market just heated up when Google recently announced Android Wear. Ars Technica has a predictably thorough look. It is essentially an upgrade to the Pebble with nicer screen and UI and deeper integration with Android. From reading the Ars article and listening to various nerd podcasts, Android Wear looks like it was rushed to market, presumably as a first strike against the iWatch of which, again, people outside Apple know nothing. The vast majority who picked up whatever phone the salesperson at the carrier store was pushing that day. Hey, it does texts and Facebook: It’s fine. The first group will no doubt pick up an Android Wear device and install strange hacks on their wrists. The second will have no idea what you’re yammering on about. That second group is who Apple wants to reach. An iteration on the Pebble or Android Wear with the customary Apple polish won’t do that. So what is coming? I have absolutely no idea, but I know that it will be successful if it meets one condition: When Apple announces it you look at it—just like with the iPhone—and go, Wow, that is so obvious.